Crop production in the Western Cape has embraced crop rotation to spread the on-farm risk, increase crop yields and increase effective weed management. 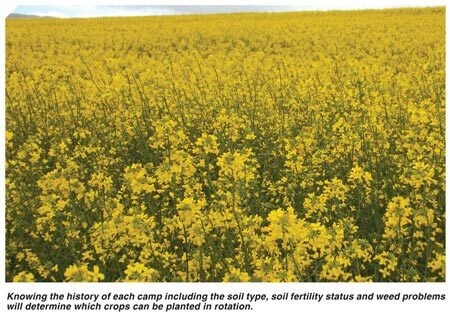 Canola forms an integral part of crop rotation for many farmers in both the Swartland and southern Cape. It is very important for farmers to know the history of each camp on their farm and which crop rotation is used on each camp. There is no rule that a farmer has to implement a single crop rotation across his or her whole farm. Certain crops like lupin prefer a more sandy soil with good drainage, while canola might not perform so well on a sandy soil. Knowing the history of each camp including the soil type, soil fertility status and weed problems will determine which crops can be planted in rotation. This makes it easier for a farmer to know which camps will be planted to which crop each year. So if your crop rotation system is in place, one would already know at the end of the current season how many hectares of each crop will be planted the following year and that helps with the timely ordering of seed. This is especially true for canola. The seed companies who supply the canola seed have to place their orders at the end of the current season, because the seed has to be produced in Australia and then be shipped here in time for the next planting season. So not knowing beforehand how many hectares of canola, therefore how many kilograms of the variety, you need and placing your order early could result in not getting the best cultivar for your farm. Deciding which canola cultivar to plant would depend on the on-farm situation and what the farmer wants to achieve. The first step in deciding on your canola seed needs, is to know the weed status of the camp. There are three types of canola, Conventional, Clearfield (CL) and Triazine tolerant (TT), each differing in their use. The difference between the types is based on their ability to handle certain herbicides. In a camp planted to a conventional cultivar, only ACCase inhibitors (Fops and Dims) grass weed herbicides can be applied. In a CL cultivar grass weed, (Fops and Dims) and Cysure (broadleaf and grass herbicide) may be used. In the TT group of cultivars a farmer may use grassweed herbicides (Fops and Dims) and Simazine or Atrazine (broadleaf and grass herbicides). The CL and TT cultivars were bred to be tolerant to specific herbicides and applying any other could kill the crop. Two broadleaf herbicides that can be used in all canola types are Lontril and Lomex. If you do not have any issues with weeds on a camp, the farmer can choose to plant a conventional or CL cultivar (manage the CL cultivar as if it was a conventional) because they are higher yielding than the TT cultivars. If the camp will be a pasture camp the year following the canola and is under-sown with lucerne or medic pastures and have problems with broadleaf weeds, a farmer may choose the CL type. 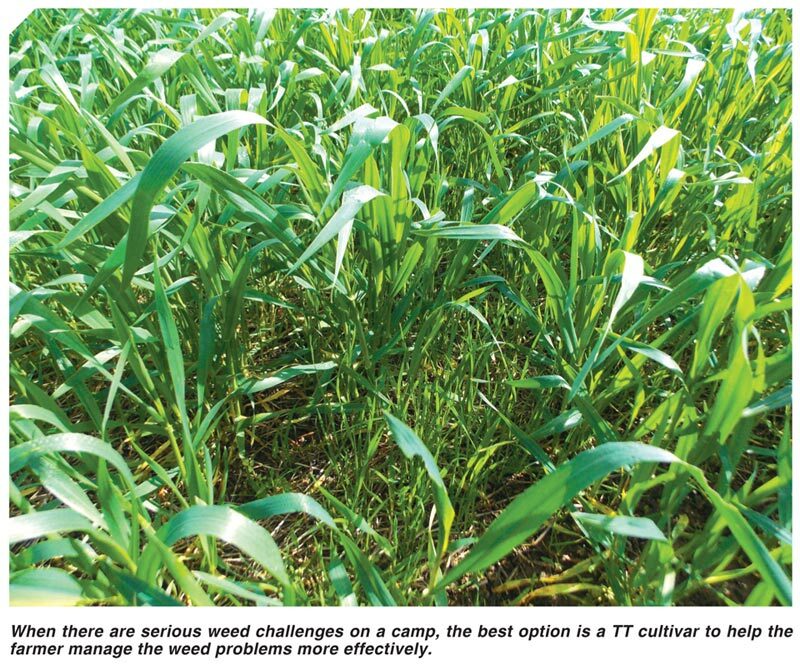 When there are serious weed challenges on a camp, the best option is a TT cultivar to help the farmer manage the weed problem more effectively. Just note that due to its genetic make-up, the TT cultivars inherently produces less (10% - 30%) than the conventional or CL cultivars. Once the farmer has decided on the type of canola needed, the next step is to decide on the growth duration of the type. There are short, medium and long season cultivars to choose from. The season is determined by the rainfall distribution in the growing season. If your rain ends early and the area where the canola is produced is a drier area, a short season cultivar will be the best option. The longer the season stays cool and has moisture a longer growth type might be a better option. The final step in choosing the best option for your farm is the specific cultivar and that will determine from which company you order your seed. Choosing the best cultivar is quite easy, since cultivar trials are planted throughout the canola producing areas and the results from these trials will indicate which cultivar performs best in your area over time. The results of these trials, done by the Western Cape Department of Agriculture and funded by the PRF, are readily available at the end of each production season. This makes it possible to order your seed early enough to ensure that you get what you really want, instead of settling for what is available. Directorate Plant Sciences, Western Cape Department of Agriculture. For more information, send an email to johannst@elsenburg.com or pietl@elsenburg.com.